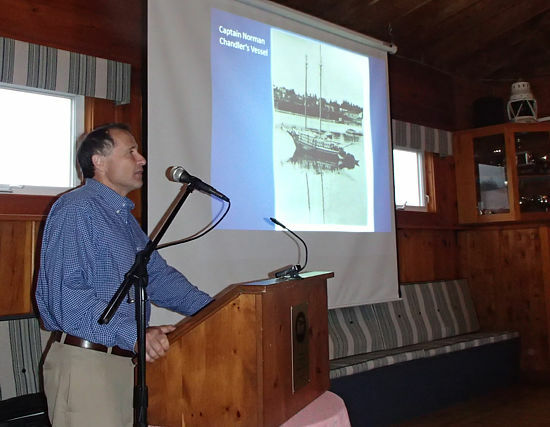 The MICA Annual General Meeting was held on Tuesday, June 7 at Lunenburg Yacht Club. Chair John Meisner called the meeting to order at 7pm. The minutes were approved from the 2015 AGM. John presented the 'Report of Directors' which included a review of the MICA activities over the past year, a recognition of the Gala Dinner and Auction and all those who make this event so successful and important for MICA, a recognition of MICA funding partners, a review of MICA fundraising, a recognition of MICA Corporate Supporters, a review of the MICA island acquisition history, explanation of property titles and stewardship responsibilities and a 'thank you' to the board of directors and all the MICA supporters. Treasurer Sherry Swinamer then presented the financial statements as prepared by Belliveau Veinotte. Sherry proposed Belliveau Veinotte be appointed auditors for the coming year which was accepted. Nominating Committee Chair Bryan Palfreyman then presented the proposed directors for 2016/2017 as follows: Martin Balcome, Syd Dumaresq, Georg Ernst, Michael Ernst, John Meisner, Bryan Palfreyman Scott Robertson, and Sherry Swinamer. After three calls, the proposed directors were elected. John then reminded the attendees of the upcoming MICA events which was followed by adjournment of the AGM. Education Committee Chair Syd Dumaresq then introduced our guest speaker, Mr. Alan Chandler. Mr. Chandler gave an illustrated informative and very interesting talk on the removal of sand from many of the Mahone Bay islands years ago. His family was intimately involved in this practice over many years. The process, as described by Mr. Chandler was tremendously labor intensive. The sand ultimately was taken to Halifax where is was used in making concrete. Sherry Swinamer thanked Mr. Chandler and presented him with a MICA hat as a token of our appreciation for his talk. Subsequent to the AGM a presentation will be made by Alan Chandler. Alan's presentation is titled "Secrets in the Sand". Alan Chandler is a fifth generation Chester resident with strong historical ties to the waters of Mahone Bay and its surrounding islands. Each of Alan's past family generations have made their living from the sea in Mahone Bay. The ocean and islands have shaped his families social and economic fabric for each of the five generation. Fishing, wood harvesting, stone gathering, recreational activities, cargo transportation (known as coasting ) and the commercial exploitation of sand have all shaped family life. Alan fished lobster, flounder, mackerel and herring with his father for over 20 years in the bay. He received his Master's degree in Marine Management from Dalhousie University in 1995. He has been with the Nova Scotia Department of Fisheries for his entire professional career. Alan has been manager of aquaculture leasing, director of both aquaculture and marine fisheries. He currently holds the position as a senior Marine Advisor for the province. Alan will be providing us with a presentation on the commercial exploitation of sand from the many islands in Mahone Bay. He will explore the origins of this activity through first-hand accounts passed down through generations of oral history. His talk will trace the removal of sand during the age of sail to the use of mechanical dredging. He will also address the role island sand played in building coastal communities and the unintended environmental consequences which are evident today.